Source: Mastercare Patient Equipment Inc. The Entrée Bath is an assisted living and special care bathing system that allows for ambulatory access without restrictions, as well as a warm air injection system, fast fill temperature controlled water supply, and push-button power operated door. The side opening allows the bath seat to extend over the floor surface by 3 in. This provides access for individuals who are ambulatory walk-ins, sliding transfer from geri and wheelchairs, or transferred by sling lifts and stand-up lifts. The self-sealing air valve outlets eliminate contaminated water from entering the internal air system, reducing the potential for cross-contamination. 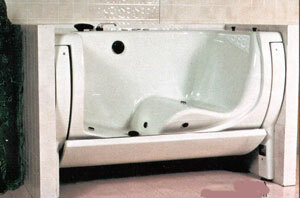 Warm air is injected evenly through 24 openings to create a gentle, soothing bathing experience. The warm air also helps maintain the room and water temperature at a comfortable level. Additionally, the system features user-friendly controls, including a self-storing shower wand and push-button controls for the tub door and bath air. Mastercare Patient Equipment Inc., PO Box 1435, Columbus, NE 68602. Tel: 800-798-5867; Fax: 402-563-9102.